This Oct. 2, 2018, file photo shows President Donald Trump arrive to speak at a campaign rally at the Landers Center Arena in Southaven, Miss. More than two years before the 2020 election, President Donald Trump has already raised over $100 million for his re-election bid, with almost $47 million still in the bank, NBC News reported. The Federal Election Committee filings show a historic amount of money that comes from many small-dollar donations as well as large donors, including $250,000 from venture capitalist Peter Thiel. The campaign spent $7.7 million over the last three months, according to the data. It also donated $2,000 to more than 100 separate Republican candidates nationwide. By contrast, President Barack Obama had yet to announce his re-election campaign at this point in his presidency and had just $2.3 million in his bank account. 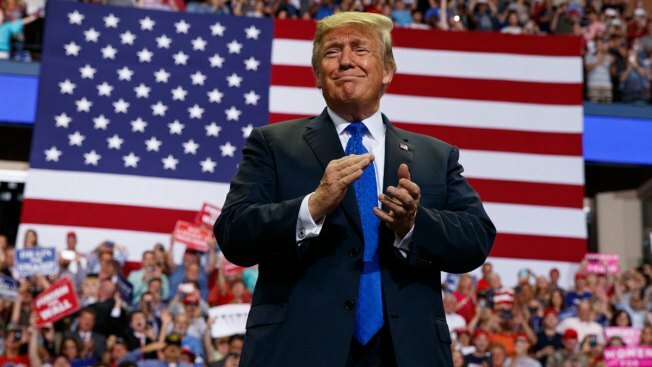 President Donald Trump announced his 2020 re-election slogan, chanting "Keep America Great!" in front of a Pennsylvania crowd Saturday. Trump also discussed congressional redistricting.